LOS ANGELES, CA (April 1, 2019) – BOOM! Studios announced today that RONIN ISLAND, the critically acclaimed new series from the team of writer Greg Pak (Firefly, Star Wars) and artist Giannis Milonogiannis (Robotech, Old City Blues), has earned a full series order of twelve issues due to the overwhelming early support from retailers and fans, which led to an immediate sell out of the debut issue. Now, islanders Hana and Kenichi must not only fight for their survival against the mutant hordes but also for their freedom under the rule of this new army -- which is difficult to do when they disagree on exactly who should be in charge and how best to save their people. 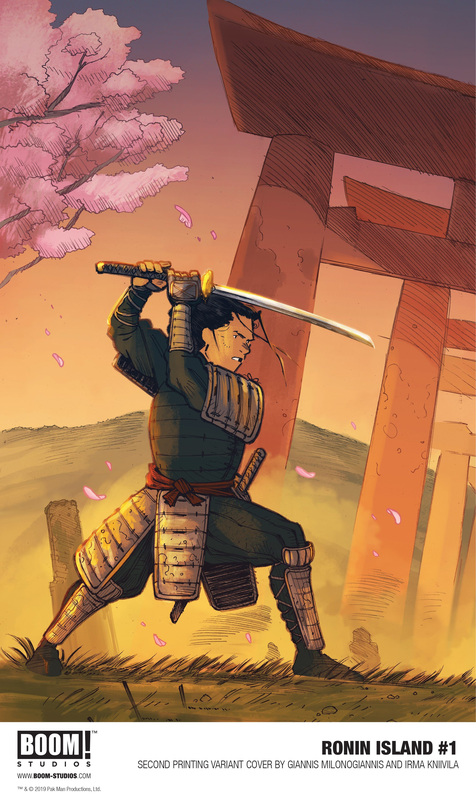 “I'm beyond excited to have twelve issues to explore the world of RONIN ISLAND,” said artist Giannis Milonogiannis. “I've always loved telling longer stories, and this news has me daydreaming about the adventures our heroes will go on and the threats they'll face. Thanks to everyone who made this possible. I'm looking forward to all of us going on this journey together." RONIN ISLAND is the newest release from BOOM! Studios’ eponymous imprint, home to critically acclaimed original series including Abbott from Saladin Ahmed and Sami Kivelä;Bone Parish from Cullen Bunn and Jonas Scharf; Grass Kings from Matt Kindt and Tyler Jenkins; and Klaus from Grant Morrison and Dan Mora. The imprint is also home to popular licensed properties including Joss Whedon’s Firefly from Greg Pak and Dan McDaid and Buffy The Vampire Slayer from Jordie Bellaire and Dan Mora. Print copies of RONIN ISLAND #1 may still be available at local comic book shops (usecomicshoplocator.com to find the nearest one). Digital copies can be purchased from content providers, including comiXology, iBooks, Google Play, and the BOOM! Studios app.